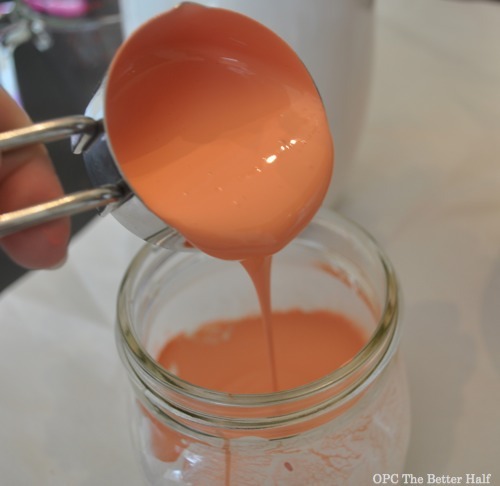 Welcome to OPC’s The Better Half. My name is Jocie, and I love to craft and DIY my home into something wonderful as I strive to be both thrifty and fabulous. I hope you enjoy comparison of Annie Sloan Chalk Paint vs Home-made Furniture Paint. If you enjoy this article, check out some other recent crafts and consider subscribing to The Better Half (email or RSS). Also, feel free to share this tutorial on Facebook and give it a +1. All the buttons float along the left side of your screen. Thanks! I am brand-spanking-new to the world of chalk paint but I’ve heard amazing things. We have a bunch of big furniture painting projects coming up (Lucy’s daybed ASCP makeover and my dining room buffet) and I wanted to preview the materials before using them on something that really mattered. 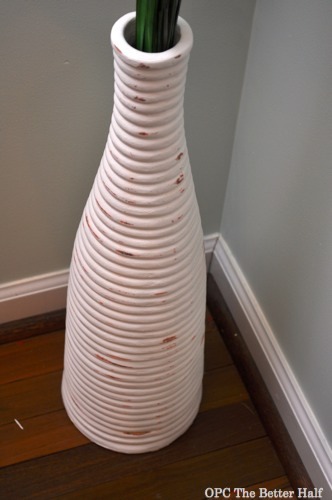 I’m hoping to do a big side-by-side comparison of homemade chalk paint vs. Annie Sloan in the coming future, but for now, I wanted to share my vase experiment with chalk paint! If you’re a chalk paint newbie like me, you might be wondering, what’s so great about chalk paint? First, you can paint furniture (and pretty much anything) without sanding or priming. Obviously, that cuts down the work a great deal! Second, it has a beautiful matte finish that can be easily sanded to look vintage and distressed. Wait, do number one and two discount each other? No. Once given a good coat or two of wax or poly, the chalk paint is super sturdy and can withstand a beating. Need, I say more? I’ve had this vase in the corner of my dining room for quite some time. I think I spent around $20 – $30 for it at Ikea and have very much enjoyed it. But, with the recent changes, I was hoping to freshen it up with some paint. I’m sure some good ole spray paint could have done the job but its mighty cold outside and was a little fume-shy after my living room frame redesign. I used a sample pot of paint from Lowe’s of Valspar – not my favorite paint but I bought a few to have on hand to use for small craft projects. Once I mixed it with flat white paint until I got the color I wanted, I then added the grout already dissolved in hot water. My adapted recipe has less water than the recipe I found online to provide better, thicker coverage. I used my new Annie Sloan brush to brush on the newly mixed paint. The brush did a great job of getting in the cracks of the vases and didn’t leave streaks or stroke marks! Not sure if it was worth the $50 but it is a good brush. The down side of the home-made furniture paint was that it took 3 coats! ouch. But it wasn’t that big of a deal considering it was a small project. Next time, I will try using better paint to see if that makes a difference (which I have heard, it does). 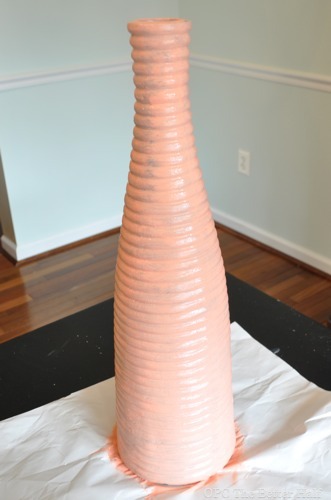 Also, the color of the vase turned out lighter that the wet paint appeared. There’s obviously a lot of hype about Annie Sloan Chalk Paint. At $34.95 per quart it is not cheap. But, I will say that it went on a whole lot thicker and covered more fully than the homemade chalk paint. It also appeared smoother and less textured once dry. So is it worth the price? I’m not sure yet. I plan on doing a much more in-depth comparison using different qualities of paint as a base for the chalk paint, but what has been your experience? After the vase had 2 coats of Annie Sloan Chalk Paint in Pure White (one good coat plus one light, touch up coat), I used Annie Sloan Wax to finish it. Boy, does that stuff stink!!! After the wax had hardened, I distressed it a bit with my medium grit sanding block. I have no clue if I made it better or worse with the distressing. Normally I feel pretty confident with my distressing skills, but not this time. Now that it’s done, I’m not totally sure which I like best. Definitely not the coral! But I am kinda regretting painting it at all. What do you think? Thanks for following along on my homemade furniture paint versus Annie Sloan Chalk Paint experiment! I’ve been wanting to try the home made chalk paint. I’m going to stay tuned to see your results with better quality paint. Thanks so much for trying the two paints and sharing what you found! I don’t leave many comments (trying to be better) but I really love following your blog!!! Awesome. I definitely like the second option better. What other colors do you have in that room? Or what room is closeby that you could grab a color from there to use? If not painting on a furniture item do you still use minwax or will poly spray work? I have a few items that could use a little TLC. You can totally use a poly liquid or spray with success. The big pro of wax is that it doesn’t yellow over time, like poly. I use homemade chalk paint. But…with unsanded tile grout instead of plaster of paris. I wonder if it makes a difference?? Love the ASP finish…it looks great! I like the finished look of the home made one…just not the color. But I think that’s a better (and cheaper!) option than the Anne Sloan one. Or maybe I just don’t like the distressed look, haha. I too like the look of the homemade one and dislike anything distressed…..it just looks “dirty” to me. I’m so excited for the homemade recipe though….I never thought to try this, then again I don’t really chalk things……thank you so much for this!!! I love it Jocie! I think you did a great job! 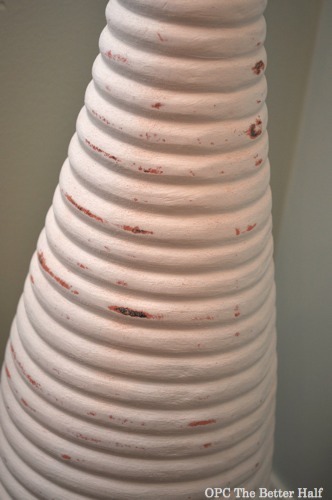 Agreed that the coral was yucky… but the distressed white with coral and grey peeking through is really beautiful. 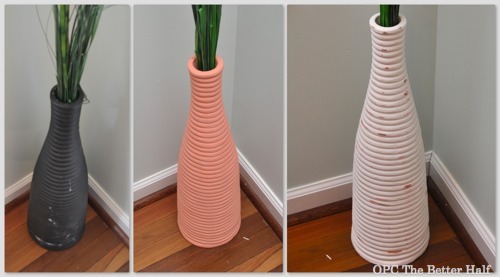 When you compare the original gray picture to the full white picture (showing lots of the grass), I definitely think the new vase “pops” more! The gray was dull and dark… blending in with the grass… just my thoughts. Good job and worth it, even though I’m sure it took longer than you liked! On a different note, I would love to do some coral objects in my bathroom… so if you want to get rid of any of the coral paint, let me know! Thanks for sharing your experience, Jocie. I like the white. Hmm I had never even heard about chalk paint until about 5 minutes ago. Interesting. I agree with a previous commenter that I like the finished look of the coral, but it’s not my favorite color for a year-round piece. Nope. Don’t regret it. The white is stunning. And I have to say that after actually using real chalk paint, I see now why is so $$$. It’s totally worth it! Hmmmm… I think I like the white better. So glad you posted this. I tried homemade chalk paint once and my piece did not turn out quite like I had hoped. It is chipping right now (probably because I got lazy and skipped the wax step!!). I just received some Annie Sloan chalk paint that I am doing a review on. I’m planning on painting a bookcase so we’ll see how it turns out. Girl I think it looks great! I love love love ASCP!!! Me too! I have a bunch of projects that I am itching to use it on! Thanks for all the trial and error. I will be trying this myself. I do like the second attempt at it better. Great job! I like either painted vase.. nicer than the grey.. IMO. I made my own chalk paint awhile ago…. 1 c plaster of paris, 2 cups paint, and a little water to thin, I was real happy with the way it turned out. I did one coat… lightly sanded.. used baby wipes to clean the dust.. then applied the 2nd coat.. lightly sanded.. and waxed using a clear non yellowing paste wax. My daughter in law placed a baby bottle on the top of the dresser that had left a milk ring, and with one wipe, it cleaned up nicely. I just can’t see paying for Annie Sloan, when I can make my own. But a good brush is a must. As for the ASCP I have friends that have tried it and weren’t overly impressed. One of them said they’d like to take the classes to learn the technique better, but after paying for the paint and supplies they can’t afford it so they won’t buy the paint again because they weren’t happy with the results they got. I tried that recipe too an found that it was too thin. I found that 4 Tbsp Plaster of Paris, 2 Tbls water & 1 c paint worked great! It was much thicker and u can always add water as u go if it gets too thick & it doesn’t affect the color. I have also been eyeing the chalk paint. Can’t wait to see your side by side comparison on some furniture. I am not sure if I dig the distressed look, but I think the lighter color really does make the vase stand out more against the color of your walls. I think its definitely an improvement over the dark, original color. Umm, what’s wrong with the Valspar? I have been painting furniture and walls for years, using different brands and finally found the one I love. Valspar w/primer. Not cheap. It usually goes on in one coat and drys to a rubber like protective finish. 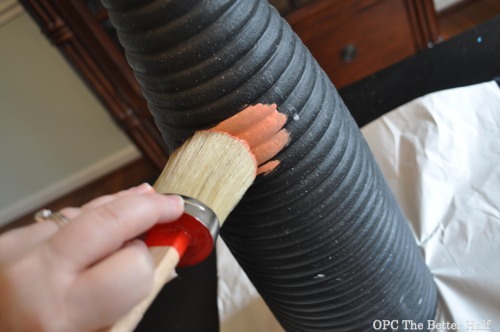 Love ASCP… I painted an entire bedroom set with less than a quart of paint. I found it cheaper than buying, primer, sanding and good quality latex. omg, lol. This whole post had me cracking up! The thing with chalk paint is to use a darker wax to give the distressed look. Also with the Annie Sloan paint you can use a damp cheese cloth rag to distress where you want, no need to sand it off. That is what all the hype about her paint is, the lack of steps needed to distress a piece. I have made my own as well as used Annie Sloan paint. My version I can’t wipe it off with a wet rag but can get the same effects. I also make my own darker paste wax. Cathy How did u make the darker wax? I like this idea, just not the colors! I just think another color might make all the difference! 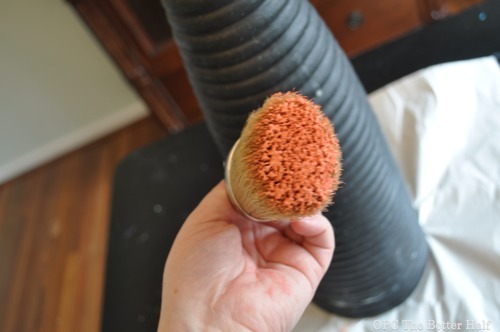 Hmmm… I think that $50 Annie Sloan brush you are using to paint is for waxing not painting or so I was told when purchasing….but good to know that it works well for both, thanks! Enjoyed the post! I realize that you posted about your homemade chalk paint, almost a year ago. I just wanted to comment that as I was buying the samples of Valspar, the clerk told me that they are only for testing a color, but not for something permanent. II was told that if you used them on furniture or the like, they would only be durable if you also use varnish. Also, if you ask them (at Lowe’s), you can buy a ‘true’ sample for less money. And it is the same as their regular paint. I tried painting over paneling and used the Valspar that contains the primer. It did a great job! But I also did a second coat since it was in my kitchen. 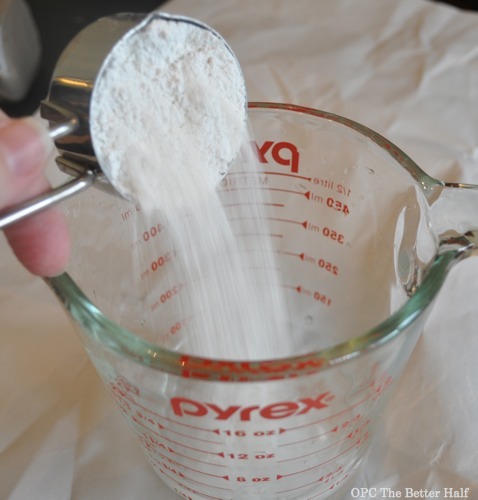 Try calcium carbonate powder for making your homemade chalk paint. It is, after all, chalk. 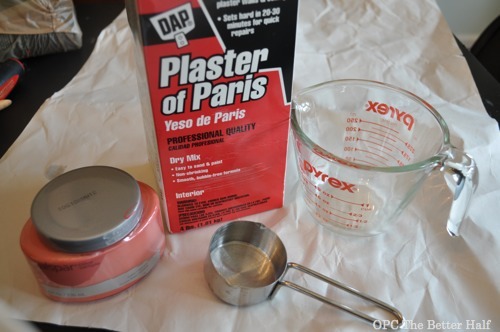 Mix two part latex to one part calcium carbonate powder. And, why’d you wait for the wax to harden before distressing? It’s less messy, I give you that. But, it’s so much easier to do before you wax the piece. And, invest in an air compressor. Being able to blow that chalk dust off after sanding is a huge time saver. And being able to blow a piece that’s been stored for a period of time is awesome. I have one that blows 175 psi’s. It’ll literally remove old, chipped paint from the to-be-painted piece. Have fun!! I definitely like the ASCP but I have also made my own in both work just as well. I like the second vase better. I don’t think you should distress the vase though. I think you should paint it solid. I have used plaster and baking soda, I actually like the baking soda, yes I have to do a very light sanding with very fine sandpaper before waxing but that’s ok. I also have used many sample paints from Lowes and Stines bot work just fine. Stines puts their samples on sale for 99 cents very often so I stock up on colors. I also check out the ops section of every store that sells paint. I have painted furiture large and small, metal, glass and many many picture frames of all material. Dining table and chairs. Oh and don’t for get the fabric. Huge King oak water bed is next. You can make the paint thicker by adding more plaster, soda etc. I would have painted the light over the dark and stressed it a tad then sealed. Yes it is easier to distress before sealing, or just dry brush your stress look on. I have some distressed and many not. I have made my own cp with plaster, worked great. Can’t see spending on ascorbic. I like the homemade chalk paint look. Maybe you would too in a color same as Annie Sloan version.